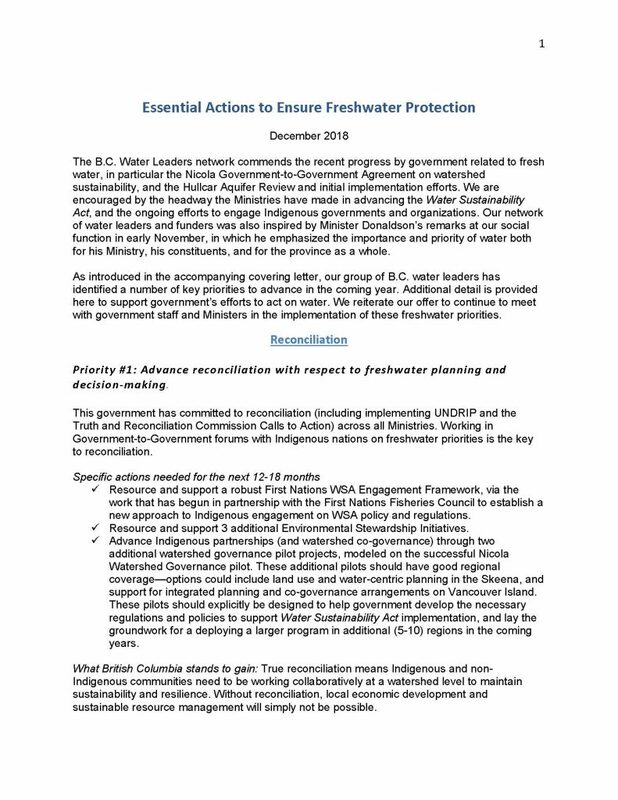 This position paper identifies priorities to advance freshwater protection in British Columbia in 2019 and beyond. It was presented to provincial government leaders and staff, including key ministers, across all of B.C.’s elected parties in December 2018. This paper was developed by B.C. water leaders and is supported by: The Adaptation to Climate Change Team (Simon Fraser University), BC Wildlife Federation, Canadian Centre for Policy Alternatives BC Office, Canadian Freshwater Alliance, Centre for Indigenous Environmental Resources, Environmental Law Centre (University of Victoria), First Nations Fisheries Council, Living Lakes Canada, Organizing for Change, POLIS Water Sustainability Project, Watershed Watch Salmon Society, and WWF-Canada.